Lots of casino players like playing roulette. This game of chance attracts attention as it is fun exciting and gripping gaming process allows players to win a lot if they are lucky. The rules of roulette are pretty simple and the game does not require any particular skills to know how to place bets and understand the main idea of the game. However, there are players that are trying to make use of various roulette betting systems in order to increase their chances to win big. 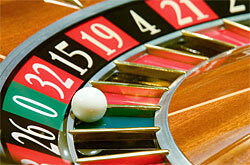 The most famous and frequently one is Martingale roulette system or double up system. Though, it is thought to be quite risky. Instead of it the D'alembert betting system is often used. It was created by the famous mathematician Jean le Rond D'Alembert in the 18th century. How to bet according to D'alembert system? This strategy can be used only for even-money bets such as even or odd, black or red and high or low numbers. These bets have 2 to 1 payouts and give players more chances to predict the outcome. D'alembert system says to increase every next bet for 1 unit in case of lose and decrease it in case of winning. How it works? Let us consider the example: if your first bet is $5 and you lose, the bet has to be increased to $6, otherwise, it should be $4. So, the possible scheme of betting can be, for example, $5 - lose - $6 - lose - $7 - win - $6 - lose - $7 - lose - $8 - lose - $9 - win - $8 and so on. The outcomes of the game are unpredictable and it is useless to calculate them in any way.